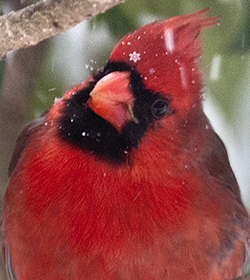 A big male cardinal and a lucky snow flake. This is as shot and adjusted for color. No trickery. Since the nation is in the grips of the heatwave like few others, this week we are sending you back to a February 2011 snow storm. The storm dumped seven inches or so of the white stuff which set up some good shots. During the storm we replenished our bird feeder on an accelerated basis much to the delight of a phalanx of neighborhood birds. Probably some non-neighborhood interlopers as well. Using the house as a blind, the birds paid little attention to us as we fired away. While we are now sweltering, take a gander at a cooler experience. 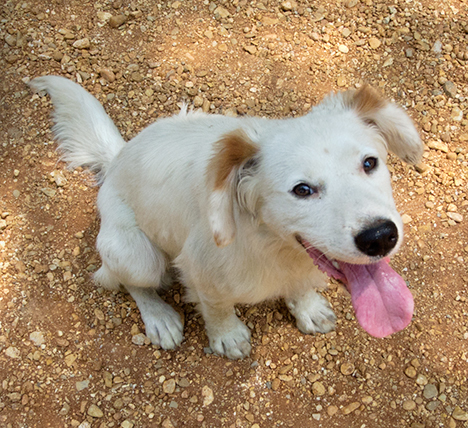 This friendly little fellow joined me when I was shooting the barn you see below. The learning curve from his initial and natural caution was shortened when I offered him a few month-old Cheetos I salvaged from the back floorboard of my truck. This epistle is actually about an old barn about to drop, but the young dog who interloped on the shoot seemed to deserve top billing. The cute factor outweighed the rustic and historic value offered by the barn. The old barn tells a familiar story to barn observers. Find out the details and see another picture of the dog and the barn by going to the Photo of the Week Page at Corndancer dot-com. We will wait here while you peruse those details. The camera is level. The barn is not. Get a good look while you can. 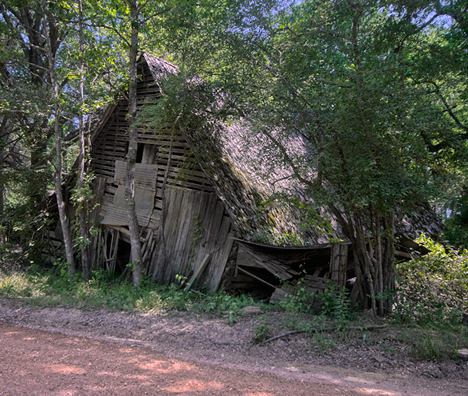 The old barn is southeast of U.S. Highway 79 on Prairie Road in Cleveland County, Arkansas. There is an occupied home on the property, but no one was there when I did the shot, so details are sketchy at best. What’s obvious from the size of the barn is that it was the likely epicenter of a large and prosperous agricultural operation which marketed cash crops and concurrently produced subsistence crops to support family, farm hands and their families, and livestock. You did not commute to work at this farm. You can see the patchwork applied to the barn over the years. Perhaps it delayed the inevitable, but not for long. Wonder if the generous hay loft was ever the site of a "romp in the hay?" There would have been a number of mules which called the barn home. A few chickens roosted somewhere inside and there was no doubt a nearby hog pen, corn crib, smoke house and an “out-house.” Also on the property, cattle probably found shelter in a cow-barn. A trip to the store took a day or more. At the time, the folks who lived and worked there, I’m thinking, were happy to be there and could not have imagined in their wildest dreams the ultimate fate of their farm and their barn. They worked hard, enjoyed the fruits of their labors, dealt with the underhanded blows delivered by Mother Nature and sometimes their fellow man. And they survived. Gives one pause to wonder how happiness is defined. Their happy is not our happy. Hmmm. I’m wondering what the next happy will be. And what will be the format of survival? 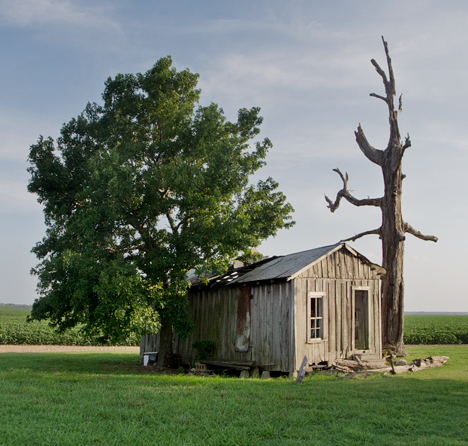 Our trip this week was to photograph this old sharecropper house near Lake View, Arkansas. The trip was two hours each way so there were plenty of photo-ops along the way. After receiving a timely tip as to the existence and location of this old sharecropper house, I set out to shoot it early Saturday afternoon. Well, not too early, it was nearly 3:00 p.m. The route from the Dempsey domicile to the target is far less than direct due to non-negotiable wetlands, at several junctures, betwixt and between the starting and ending points. The trip figured at two hours each way, not counting stops for shooting. Not a bad thing considering the mother lode of photo-fodder one normally encounters in the Delta. See some more pictures and read astute observations of this rare old sharecropper house on the Photo of the Week page at Corndancer dot com where this story started. We’ll wait here. 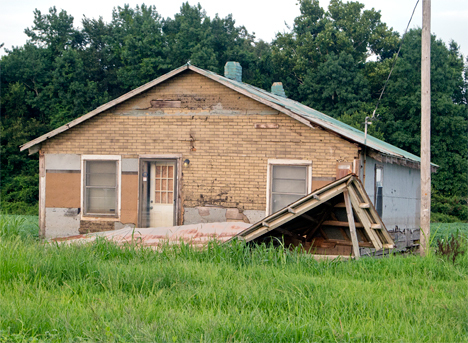 See more pictures of the old sharecropper house in our Weekly Grist Gallery. At more than 100° in the shade, it’s hard to image ice-encrusted tree limbs, but that’s why this tree is trimmed the way it is. Falling limbs zap the lights. Note the burned lower trunk. (My apologies, this picture has some bad faults). 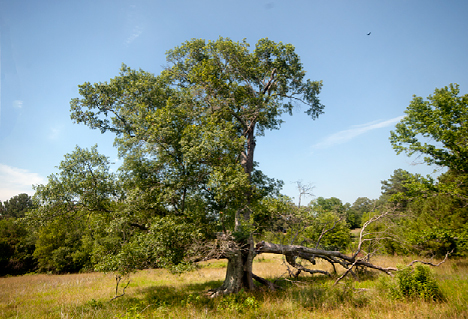 This old tree like many in these environs has been trimmed to prevent it dropping limbs during the ice storms we endure occasionally in rough winters. One does simply does not want the TV to falter at the crux of a serious football game or pickup truck commercial. Regarding the tree, to add injury to insult, its lower trunk has sustained fire damage. Despite fire damage, the old tree seems to be holding its own. 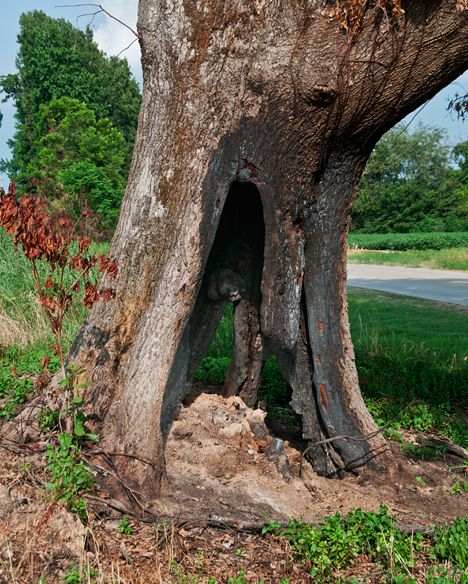 The fire which charred the truck killed some foliage, but the old oak seems to be oblivious to the damage. Good luck tree! You will see all sorts of things on a swing through the Delta and abandoned houses may lead the charge. As farming becomes more automated and less labor intensive, people are moving into more populated areas for employment. If it lasts that long, the house below will eventually be in the same condition as the one above. It’s same song, second verse here in the Delta. In 2010 it rained like a monsoon, then turned as dry as the Gobi Desert. Welcome to 2011. The only difference is the extra 1. The good news is, the farmers are cranking up the center pivot irrigation systems and that always makes for good pictures. These mechanical quarter-mile-long monsters crawl in half-mile circles refreshing thirsty cotton and beans as they go. I must add that my farmer friends will castigate me for saying cranking up center pivots is good news, but they do make for some cool pix. 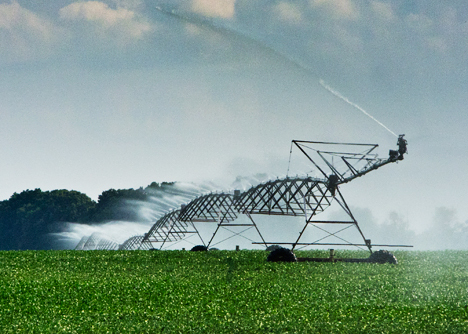 This huge center pivot irrigation system is providing life-sustaining water to a growing cotton crop a few miles from the old share cropper house you saw above. 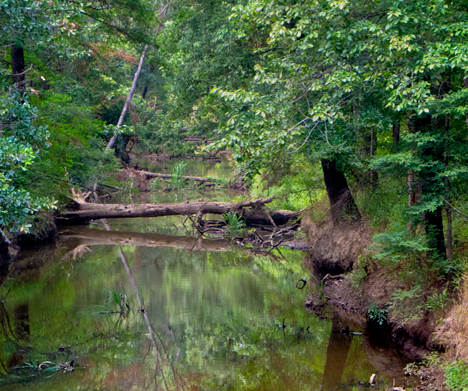 As you cruise through the Delta, you will cross hundreds of creeks, “brainches,” and irrigation ditches. Some are civilized and some are about as inviting as an equatorial swamp. The one below fits that category. The critters in and around it will strenuously object to your presence. Some will manifest their displeasure by departing the scene. Others will come at you with malice. Enjoy these wild snippets of nature at a comfortable distance. See more pictures of this trip in our Weekly Grist Gallery. Observe and enjoy this sanctuary for untoward critters from a respectable distance. I was burning daylight and rushing to get home before dark, but saw another center pivot with back-lighting from a setting sun. It was worth the stop. Things have to be just right for images like that, so it was voluntary delay. The sun behind the spray gives a gossamer look to an industrial application. Not bad for a bunch of good ol’ boys. When I rolled in the dogs were waiting, to administer a slobbery welcome. It’s nice to have friends who jump for joy every time they see you. Take a gander at more shots of the old sharecropper house, some vehicles garaged in a weed bed, another center pivot shot, and a eatery with great personally unfulfilled promise in our Weekly Grist Gallery, this week with 25, count ’em 25 pictures. These lilies are happy catching rays in 100° weather. You probably would be too if half of you was snorkeling. 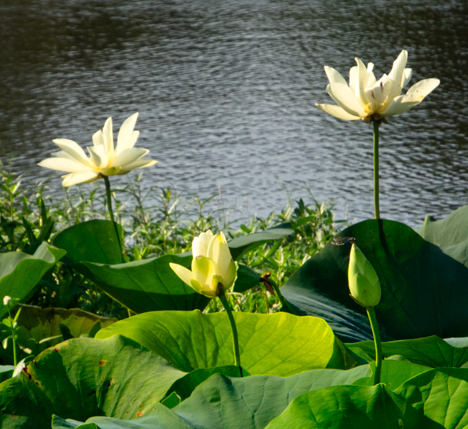 Water lilies, I learned, have to be stalked, if you plan to photograph them at full bloom. The persnickety posies are not beholden to daylight savings time. At around 3:30, I discovered after several trips, they close up shop and fold their tents, so to speak, for the evening. I shot these about 8:00 a.m. or so on July 10, 2011, after several of the aforementioned fruitless afternoon attempts. Click on the picture to look under the bridge. This adventure started under a bridge not far from these lilies. See this auspicious beginning on the Photo of the Week page at Corndancer dot-com. You’ll see an unusual and somewhat creepy picture under a bayou bridge, a dragon fly convention and some other interesting shots and verbiage. We’ll wait here while you look. 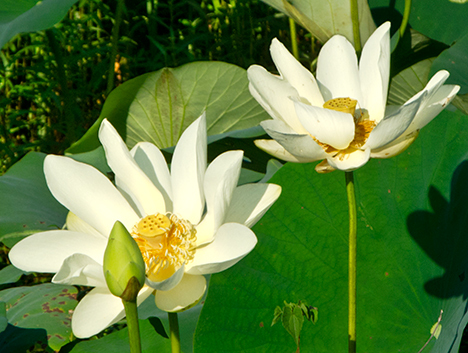 These lilies reside in a nice cypress-lined pond on South Hazel Street, just south of I-530 exits and the Hazel Street Bayou Bartholomew bridge in good ol’ Pine Bluff, Arkansas. They sit there in plain view as if begging for attention, but I’m guessing they are ignored for the most part. Motorists there are either turning, exiting, entering, or trying to break the speed of sound. You can see the developing seed pod in this bloom. Cured, these pods are the wierd looking things full of holes you see in dry foliage arrangements. See the “under the bridge” pictures and more lilies in our Weekly Grist Gallery. Fortunately, the lilies feelings are not hurt when they are ignored. They politely go about their business, look cool, and make new lilies. They may be on to something. 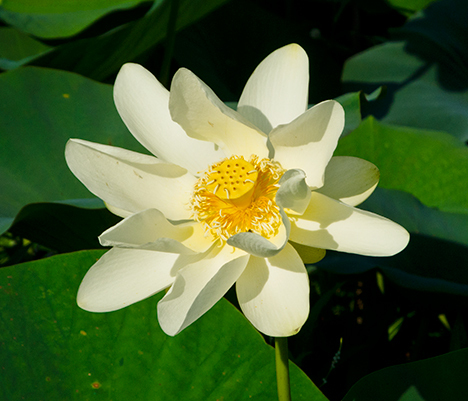 The idea is Biblical, so it’s not new: “Consider the lilies of the field, how they grow; they toil not, neither do they spin: and yet I say unto you, that even Solomon in all his glory was not arrayed like one of these.” (Luke 12, starting in verse 28 and ending in verse 29). I’m guessing that Almighty in his infinite wisdom would agree that this reference holds true for water lilies as well. These lilies are standing at attention, ready for inspection, which I believe rarely occurs. The late Kodakamus Orlando Glover-Dempsey, Junior, The Third, AKA: "Kodak." 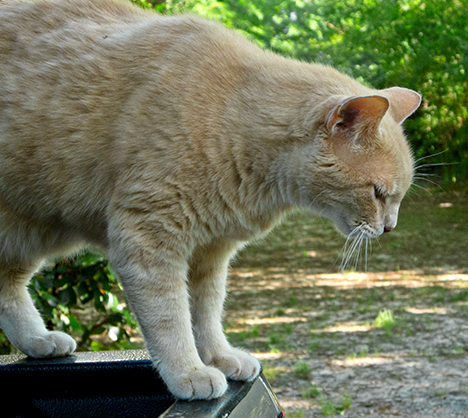 Perched here on the back of the pickup, he thought the truck was a giant cat bed parked for his convenience. We feared the worst a day or two after I shot this picture of Kodak, our fine tabby. He weighed about thirteen pounds and was the undisputed King of the Hill. He liked me, put up with Pat, and barely tolerated others. That fateful morning when he did not make his normal scratch on the window between around five and six in the morning, we suspected something was amiss. That was about a month ago and he hasn’t shown yet, thus the kitty obituary. We miss you buddy! Take a gander at 12 pictures in our Weekly Grist Gallery. You’ll see the ones you see here, except bigger and sharper, plus the “under the bridge” shots and more around Bayou Bartholomew. Click go and look. Some things you simply do not expect to see. 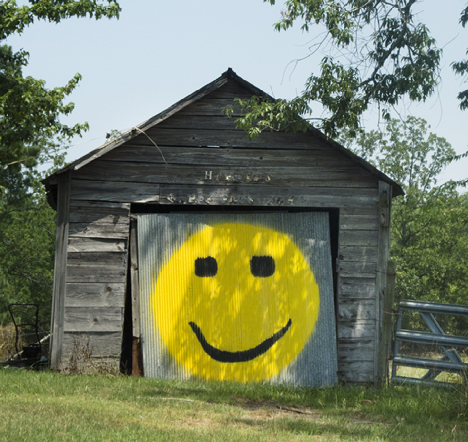 A 9-foot tall Smiley on a garage door is right at the top the unexpected list. Seeing it is one of the rewards of an unplanned trip with no direction in mind. This adventure started east of Bismark, Arkansas where I joined my in-laws for a niece’s 28th birthday celebration. I enjoyed a great lunch, a fun gift opening, and a good visit before departing. When I left the party with no plans or a clue where I was going, I had this realization: If I was to be home by dark, I had about 4-1/2 hours to meander around the territory before heading east toward my humble abode. Here’s what happened. The first thing I did was to temporarily ignore my sister-in-law’s admonition to turn north on Highway 128 on Highway 84 toward Hot Springs, Arkansas. Instead, I turned south. In so doing, I found the Smiley garage above. Before we go too much further, may I invite you to get in on the start of this story on the Photo of the Week page at Corndancer dot-com. You will see a couple of pictures of a curious horse and a great old barn on Ragweed Valley Road in Garland County, Arkansas. After finding a good gravel road that eventually connected with Highway 128 north and then making that connection, I discovered that my sister-in-law’s advice was well given. I’m glad I listened. Looking north on northbound Highway 128 descending from Jacks Mountain. Shot while stopped with a point-and-shoot held out of the truck window. Highway 128 winds up Jacks Mountain from south to north. When the descent starts, a fine mountain vista appears — with no place to pull over and photograph it. Traffic was light, so I stopped and I held my recently acquired Nikon point-and-shoot out of the window and got a couple of quick shots, one of which you see below. See the other one, a bit wider, in our Weekly Grist gallery. 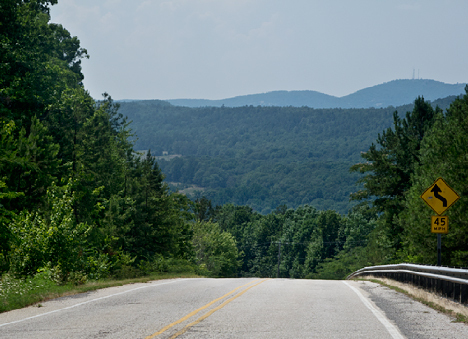 Avoiding the thick Independence Day weekend holiday traffic in Hot Springs, I headed West on Amity Road, formerly Highway 192 according to my outdated map. I found a memorable home-place tree, the right side of which was missing, along with most all other vestiges of the former home place. An old home place tree on Amity Road west of Hot Springs. The property owner happened by while I was shooting and explained that this one is the survivor of two similar trees on the home place of his father and mother. Each had "their" tree. The home and the other tree are gone, as is the east side of this tree. 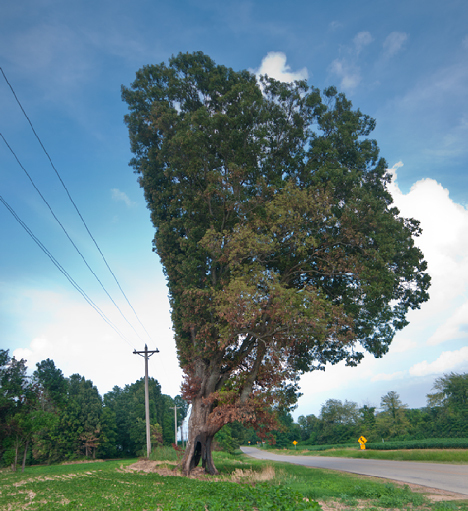 See more of this tree in our Weekly Grist gallery. Eventually I made my way to U.S. Highway 270, the way home. I hit 270 at Crystal Springs and immediately pulled into the Crystal Springs General Store. There I found the good ol’ boy elixir for a hot, sweltering afternoon, a big Barq’s Root Beer ice-cold. Now refreshed, I had to admire the straightforward security statement at the entrance to the store. This sign is old. You can detect the sign painter’s brush marks, a thing of the past. 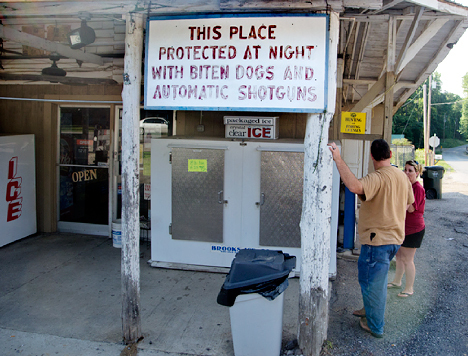 This low-tech security system has worked well for years so the proprietor of the Crystal Springs General store says. Sometimes lack of direction is a pleasant respite from highly focused, pressure-cooker routines. It does well to recharge one’s system and in this case, exposes you to things you would not have seen otherwise. The rub is, you have to return to organized effort, so you can afford to temporarily abandon it again. Click the barn for more pictures in our Weekly Grist Gallery. See a neat little barn, the pregnant Jenny, another shot of the horses on Corndancer, a cool country church and cemetery, more views of the home place tree and a house with a gravel yard and hundreds of trinkets in our Weekly Grist Gallery. Lots of pix, lots of fun.